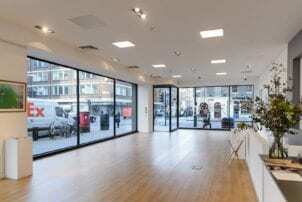 Offering 3,300 sq ft of high footfall, high visibility retail and event space right on Baker Street, Carousel Next Door is the dream venue for your next concept store, fashion show, product launch, sample sale, art exhibition or pop up. With floor to ceiling windows at street level, elegant wooden floors throughout and clean white walls, it’s an ultra-flexible blank canvas space that can accommodate up to 250 guests at a time. And with neighbouring Carousel just a few yards away you can also add all of our award winning food and drink, staffing and production into the equation.